Mccalls 6652- on being a reluctant dragon. I have a need to keep buying top patterns. I never seem to find the perfect one. 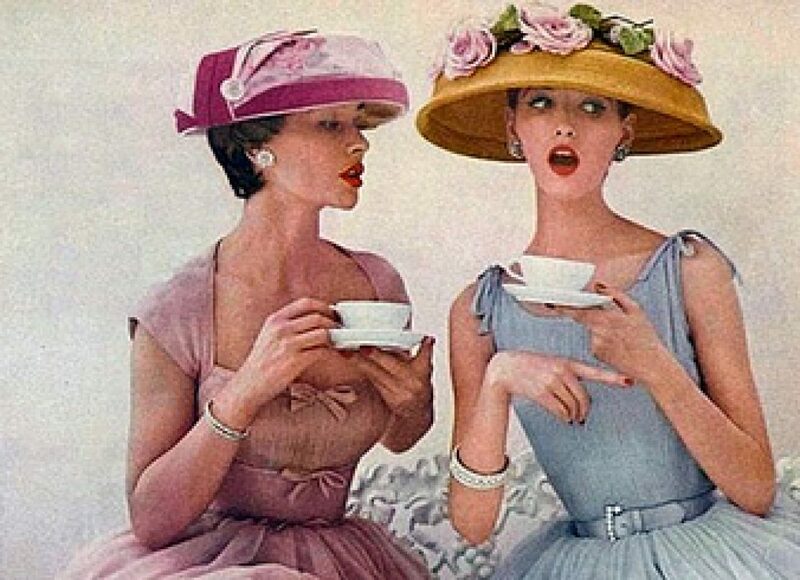 I have a few I’ve made multiples of- Simplicity 3786 and 2059 are sort of go to, but I swear, I will find the ultimate pattern and we shall roam these hills in sassy splendour evermore. The latest new victim was Mccalls 6652- or, as I like to think of it: Mccalls, Curse of the Reluctant Dragon!! I know, I know- you are thinking why would I even pick this up? Its a prehistoric mullet top. Not exactly a thing to behold. Does anyone yearn for their tush to form a windsock? I like how they threw a snowy background behind the model to keep you from picturing Charlie Brown and the kite eating tree. This went together like a plan- I french seamed it and used an Anna Sui print for the center panel- I worried that in just one color, I would in repose resemble a giant floral whoopie cushion. We all have our little fears, right? This pattern will not be the goto blouse pattern, the search resumes, but it’s doable. It’s frisky and different. Now here is the part I found amusing. I’m wearing it backwards. All that heavy gathering in the back to form your tail is still there on this view and the weight just drags it back and gave me a little strangled feeling- it’s crazy- I felt like Isadora Duncan. You can see how the shoulder seam is pulling backward on wind sock model. So I tried it on backwards- viola (and other stringed instruments!) it’s much more comfortable like this. Who knew? Don’t tell anyone- it gives it a secret Walk of Shame aspect, doesn’t it? In the dragon theme I give you my ‘Mother of dragons’ concept. Look at their fierce, fire-breathing selves! Grr! Look out Goffrey! Really, I don’t hate this. It’s comfortable, but less than flattering, but I knew that going in. Billowy and flattering are never used in the same ad, are they? Its very comfortable- like a floral flying squirrel! You are too fantastic. You look like Isadora Duncan WISHES she could look. In an interpretive dragon dance? Come on, that top looks cute on you. Perfect for a hot summer days. Is it wrong that I’m imagining your doggies in dragon costumes? I know they would not put up with those kind of shenanigans in real life. Their breath is bad, so bad- but not at flame level yet! I like it, PG. I think it makes your legs look sooooo loooonnngg. Or maybe they just are long. In any case, you make this pattern look good. I am a collector of patterns and don’t even pretend (any more) to be searching for The One. 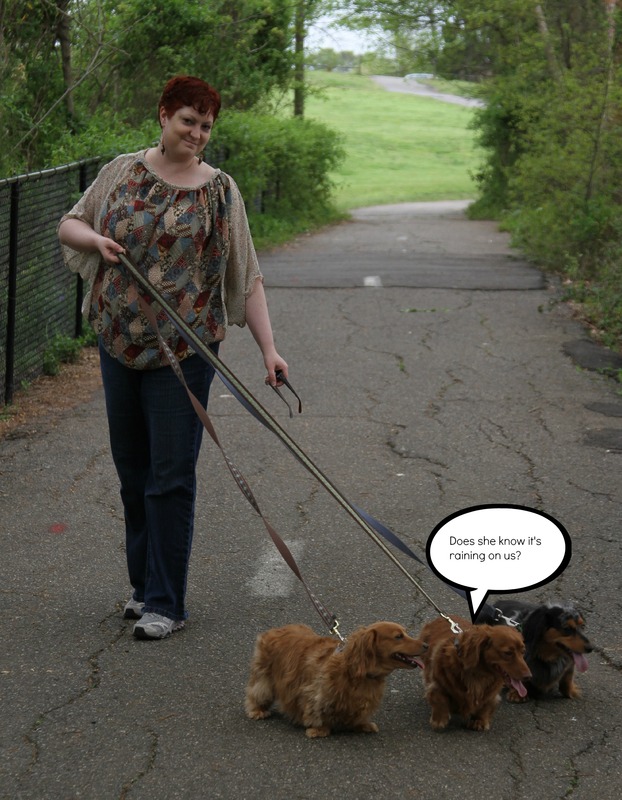 The secret is having dachshunds! They make you look leggy! This looks great. Good save on the neckline. Wearing it backwards looks great! Cute puppies. They look happy. They were thrilled to go to the park- holding still was not in their plan, tho! You have the best blousey jackets- I knew you’d understand my quest! I never knew I was supposed to be looking for the ONE. Where’s my memo? I love buying patterns and I thought about picking this one up for the wing sleeves. Thanks for the great photos with your cute triplets and the pattern info. I probably won’t buy this one now because its a choking hazard. Backwards!!! Who knew? I think sometimes pattern companies have no idea what shape our bodies are. I think it looks really lovely on you, I like flowy, non tailored clothing. And, you doggies are looking adorable!!! I really should notice the odd stances, the weird twirling and take it for the poor design camouflage it is on an envelope! A giant floral whoopie cushion? I’m still giggling…. It happens! Back to V1247, I guess. I like it too! But I always like a top that is loose and flowing. Love that you’re wearing it backwards. Never nice to be choked by your clothing. I can’t imagine if this fabric were heavier- sputter, sputter, choke. Trust you to be a rebel and wear it backwards!! Seriously – I think it is really flattering on you, I was thinking that you are looking positively svelte in the photos. The jeans under the flowing top is a great look on you. I love that top and the fabric you have chosen really suits your colours. Great job Anne. Aw, thank you Ma’am- I think it will see the light of day a good bit this summer, backwards and all! I adore a bat wing top, and while it may not be ‘the one’ in terms of a pattern, it’s pretty! Love the fabric too, and thanks for the giggle over the giant floral whoopie cushion! I feel; like showing large gals in scary blouses is my calling…. I’m seriously gasping from laughing about the floral whoopie cushion, LOL! I think it looks fine, it’s not earth shattering, but like you said, hot humid summers require as much air flow as possible and this fits the bill. 🙂 Or at least as close as you can get to naked without being arrested. 😉 And yay for cute doggies! I ❤ the dapper little blue one, is s/he a mix with a blue heeler or something or is that just a color they come in once in a while? 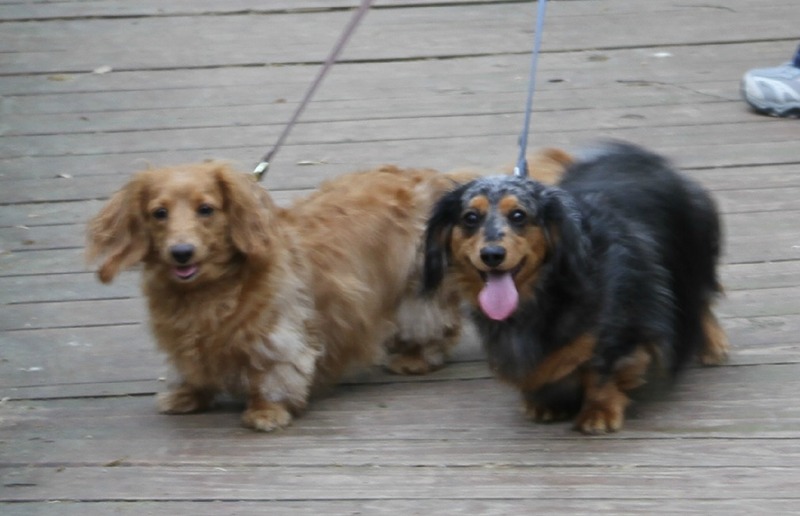 Bruderlein is a black and tan dapple- not too common, but AKC still accepts his checks, luckilly! Texturally he even feels different than the girls, one of Liesls littermates is his father. Me likey! I like the print combo too. Oh and your 3 fierce dragonettes are cute too. Death from the ankles down! 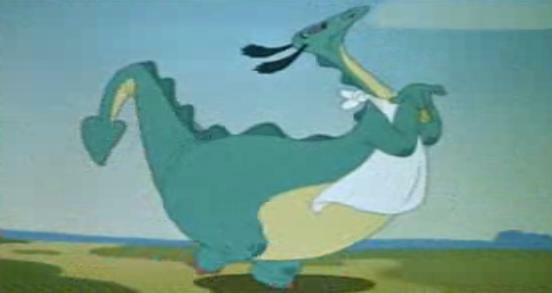 Holy crap, I totally forgot about the movie the Reluctant Dragon till I saw that picture! I had it taped off of TV and used to watch it all the time! I tried to find a clip of the theme- that was one swishy little dragon! I never noticed as a kid.. I did turn it right ways to show the husband- he immediately shook his head and said, ‘put it back, put it back’ …. This is a 1st world problem, isn’t it? I own 800 patterns and none are perfect?! Jasper and I are shocked and horrified that you tortured your poor babies by being out in the rain. Jasper doesn’t “do” wet, doncha know. OH right, the top, the reason for the post. I think it will be lovely when the temperature reaches obscenely hot temperatures. I do agree, that it isn’t going to be your TNT. It was misting! I swear, Don’t call the society for the prevention of cruelty to overly spoiled fluffy things!! 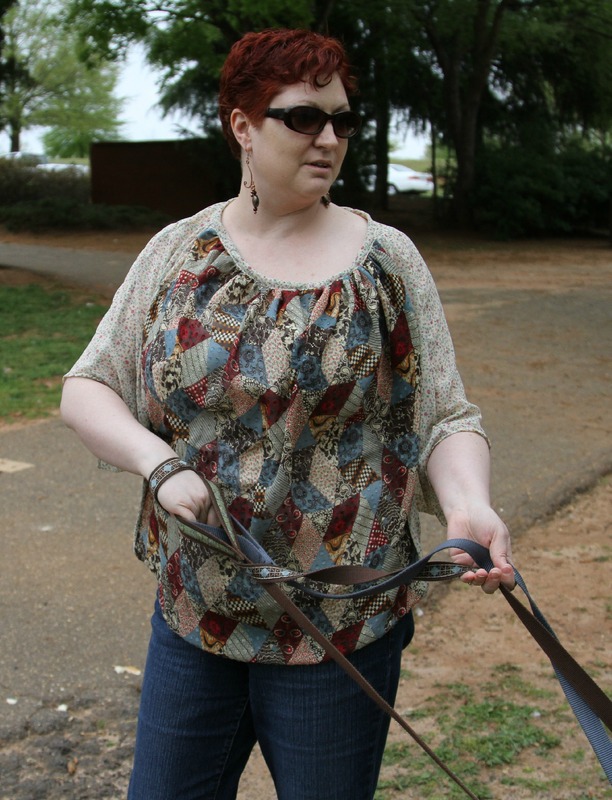 While holding 3 leashes by a duck pond while children are eating popsicles nearby- you will do an interpretive dance whether you like it or not! Don’t laugh but a pair of casual shorts with elastic that I made recently felt so much better worn backwards. All this talk of dragons is making me want to watch Game of Thrones. I’ve missed series 2. I do like how you’ve used two fabrics to balance off the design lines. This would be a great top to wear in a hot, humid climate like our summer just past. I have Chris Lucas to thank for the contrast, she helped me decide to put it in the middle. Now I’m still on GoT series two, so was a bit slow on the uptake, and am on the bit where Mother of Dragons has had hers stolen…you’ve clearly learnt that leashes will make this harder!! I couldn’t let Anna Sui down- it would have hurt my heart! I think you and your pups look adorable. Isadora has nothing on you! Gah, you’re basically the Khaleesi in that top. Love it! Lovely top…very flattering! 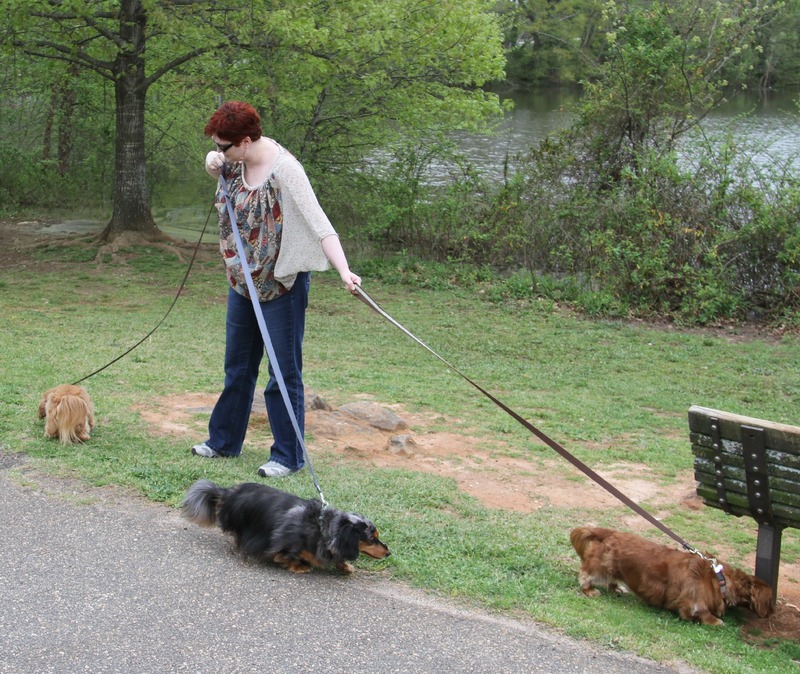 What really got my attention was the pups leashes are color coordinated to match top…..nice!! They melted like lumps of spun sugar! That’s very cute. I like that fabric. I really like how you’ve chosen to use contrast between the sleeves and front of the shirt. The blouse looks lovely. It’s easy and carefree while looking classy and put-together. Wow, classy and put together? No one has ever accusede of such! Thank you! It gets balloony so quickly, doesnt it? Great post, and the top too, nice sleeves and fabric- inspired wearing backwards. That first pic I thought you were out tilling the soil in your patchwork – Diana Vreeland has nothing on you when it comes to styling a shoot! I used to have a flowy rtw top that I wore backwards for the same reason. (Why did I buy it, you ask? Oh, cause I’d accidentally tried it on backwards too and then decided I liked it like that.) Who likes being choked by clothing? And really, it looks good on you. I wouldn’t have guessed it wasn’t meant to be that way. “Prehistoric mullet top!” I just spit my coffee!!!! Actually, your version is pretty cute. Who cares what the dogs say, you need to walk that top all around the neighborhood to show it off. Thank you! I felt quite sassy! Oh good someone else wears stuff backwards too. See, I knew it was a thing! Love the Anna Sui patchwork quilt print!! Usually its a 2 person gig- if the girls are together they behave but Bruder just keeps trying to get in the middle! I love reading your blog, you are so brilliantly entertaining! I love that you’re wearing this backwards – always the creative problem solver!